Announcement Welcome to Day Three Creations! As seen in Country Living Magazine, on HGTV's Love It Or List It Vancouver, on DIY Channel's Stone House Revival, at the Ritz Carlton Hotel Lake Tahoe, in Buzzfeed, on Emily A. Clark's popular award-winning design blog, in Etsy Finds, the Etsy Blog, Etsy Sellers' Handbook, and in all 50 U.S. states and on six continents. My work has also been used by some of America's top interior designers. 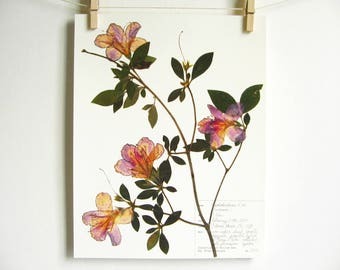 Here you will find high quality herbarium specimen art. 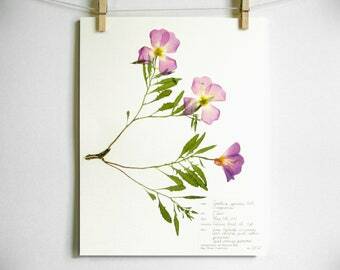 I create framed original botanicals (real plants), and prints using archival paper. 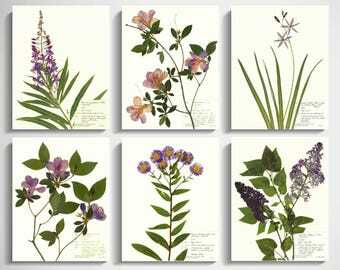 My original botanicals are made from carefully selected real plants found mostly in Oregon's, Colorado's, and Louisiana's natural flora that have been pressed, coated, and artfully mounted on high quality paper made especially for preserving plants. Each plant has been labeled according to the standard use in an herbarium (a "library" of preserved plants used primarily by researchers). Special attention to scientific accuracy and preservation as artwork have been given to each piece, along with a lot of joy and hard work. I hope you enjoy these in your home as much as I did making them! Please check back periodically for new specimens and prints! Welcome to Day Three Creations! As seen in Country Living Magazine, on HGTV's Love It Or List It Vancouver, on DIY Channel's Stone House Revival, at the Ritz Carlton Hotel Lake Tahoe, in Buzzfeed, on Emily A. Clark's popular award-winning design blog, in Etsy Finds, the Etsy Blog, Etsy Sellers' Handbook, and in all 50 U.S. states and on six continents. My work has also been used by some of America's top interior designers. Black Botanicals --Add a Black Background to Any Botanical Print! Beautiful presses, incredibly high quality. Everything shipped on time and was in perfect shape upon arrival. Put these up today. They are beautiful, high quality prints. They look great together on the wall! Would buy again, for sure. 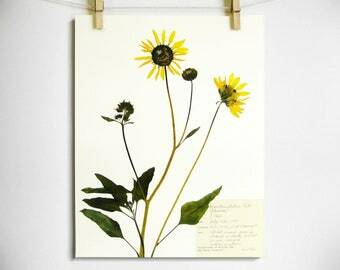 I arrange each of my pressed plants on herbarium paper before mounting. I was born and raised in Colorado, where I developed a love for both art and science. In 2005 I earned a B.S. in Biology, and in 2007 a M.S. in Botany, specializing in the evolutionary classification of plants. During my time at Colorado State University I taught labs in Botany and Plant Identification and spent summers locating and collecting plants in the foothills of Colorado for use in these labs. Students learned to collect, identify, press, mount, and label plant specimens for use in an herbarium, which is a library of preserved plants used by researchers. Within a couple of years of my graduation, I married Anthony, we had two kids, and I had decided to stay at home to raise and homeschool our kids. In 2011 we moved to Oregon at which point Anthony transitioned out of his career in engineering and into full-time Christian ministry and started attending Seminary. I began looking for a way to earn income at home while raising our kids. Wishing I could find a way to combine my love for creating art and enthusiasm about plant science, I was reminded that I had all the skills required to make scientific artwork from real plants! 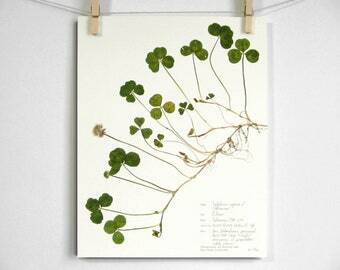 Thus, one evening in June of 2013 we decided that making artfully arranged herbarium specimens and selling them on Etsy was the perfect side-job for me, and so we started our business, Day Three Creations. My training has not only equipped me to create clean, professional herbarium specimens, but also to collect plants without doing damage to the environment. I choose my plants based on their commonness, location, size, and aesthetic quality. My part-time profession as a scientific artist has been a family endeavor. Anthony, who is wonderfully supportive, is skilled in business management, in developing processes for manufacturing, and in quality control. Together we have developed a “lean manufacturing process” for creating high-quality art. Our whole family enjoys going together on collecting trips and scouting for the “perfect plants”! My greatest desire is to see my botanical artwork bring honor and glory to God, who in His unfathomable love spoke into existence the heavens and earth and everything in them. I hope you've enjoyed our story! Please take a look around the shop. I'd be happy to answer any questions you might have. Hi there! My name is Allison and I, together with my husband, own Day Three Creations. 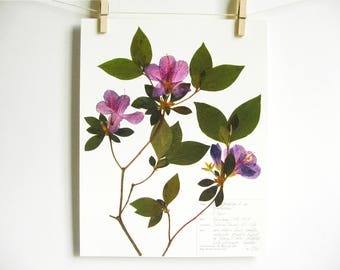 I collect all of the plants and make the herbarium specimens we sell in our shop. I also do the photography, listing, shipping, answering convos, and bookkeeping. My husband serves as my manager and has used his expertise in Production and Process engineering to help me create standard processes for everything from creating to shipping. He also helps me make important business decisions and appraises my work. 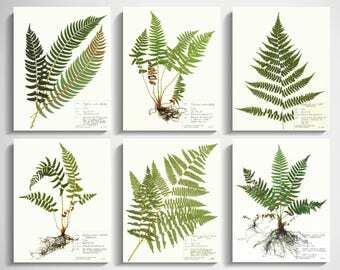 My prints are made with the expertise of some great people at a few local print shops who have helped turn the raw images of my herbarium specimens into life-like prints of the originals. Currently, they are printed at a small, family-owned shop here in New Orleans. Thank you for visiting my shop policies page! As a general rule, I want you to be fully satisfied with the products you receive, and I'll be happy to work with you if problems arise. Please contact me if you have questions or suggestions. In the instance an item is damaged, please take pictures of the damage and contact me as soon as it arrives. A refund or replacement of your choice of similar value will be shipped to you. If for any other reason you are unhappy with the product you've received, you may return it to me within 14 days of delivery and I'll issue you a full refund (minus the shipping costs). Please package and ship framed returns via UPS or Fed Ex to minimize risk of damage. I offer reduced combined shipping rates for multiple items! Free shipping on domestic orders of $50.00 or more! ****Please be advised that for some international orders, additional customs, duties or VAT fees may be collected from you by your country upon delivery. Prints are shipped securely via USPS with tracking in an acid-free clear cello sleeve inside a rigid mailer. Framed items are professionally packaged for framed art and are shipped via USPS with tracking and insurance. One of my favorite parts of this job is doing custom orders, and I would love to do one for you! Each of my original framed specimens are appraised after being completed. As such, for most custom orders on original specimens, I won't be able to give you an exact quote ahead of time. I'll give you an estimate based on averages as well as a maximum quote. Depending on the nature of the work, a custom charge of up to 20% (before shipping) will be added to the finished work's appraisal as well as a down payment of 50% of the estimate. If you are interested in a custom original specimen, please convo me for more details. If you would like a different frame color than is shown in an item's listing, there is no additional charge for switching. Please convo me or let me know with your purchase. The shipping time of 1-6 business days can't be guaranteed, though, as I might not have the specific frame color on hand. I'm happy to offer a discount on bulk print orders! A refund of 10% will be given on orders of 20-49 prints, and a refund of 25% will be given on orders of 50 or more prints. If you are ordering from another country, please note that your home country may charge you additional customs, duties or VAT fees. To find out more about your home country's customs laws, visit your government website or contact your local post office. Again, please don't hesitate to contact me with questions. Happy Etsy shopping! To fulfill your order, you must provide certain information (which you authorized Etsy to provide to us), such as yWhy I Need Your Information and How I Use Itour name, email address, postal address, payment information, and the details of the product that you’re ordering. You may also choose to provide us with additional personal information (for a custom order, for example), if you contact us directly. • Service providers. We engage certain trusted third parties to perform functions and provide services to my shop, such as printing and delivery companies. We will share your personal information with these third parties, but only to the extent necessary to perform these services. For purposes of EU data protection law, I, Allison Daw, am the data controller of your personal information. If you have any questions or concerns, you may contact me at daythreecreations [!at] gmail.com.